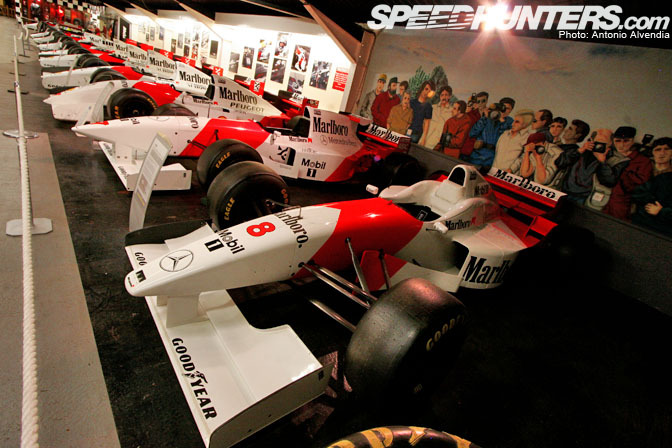 On my visit to the Donington Park Grand Prix collection, I thought perhaps one of the most striking and moving exhibits was the one in the McLaren Hall, which showcased the F1 cars of several legendary McLaren drivers, including famous greats like Mika Hakkinen, Alain Prost, and of course, the legendary Ayrton Senna. This was perhaps the most visually striking exhibit to me, just because of all the symmetry and history going on here… look at all the cars lined up, it's amazing. You might also notice the changes in aero bodywork over the years, as shown by the evolution of the noses on the cars, and the frontal wings. Simply amazing. To have two rows of cars with old photographs hanging above them, it really moved me. Seriously! As I stood in this hall all alone, taking photos with my camera and tripod, I could hear the wind softly whistling over the thin roof of the building, and combined with the sights and smells of the McLaren hall, it made for an unforgettable experience. I absolutely loved all the huge prints hanging above the cars, with great examples of F1 photography. 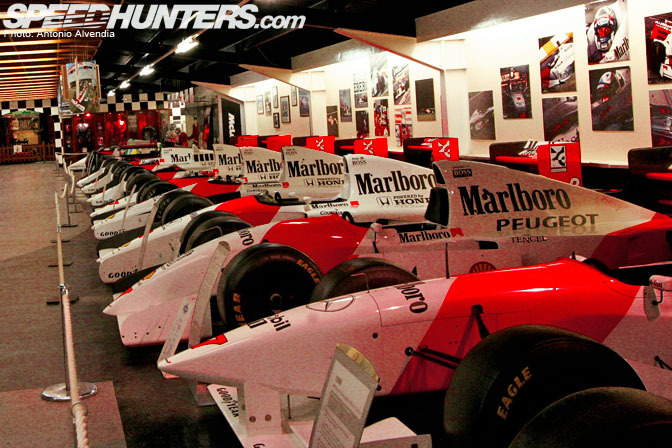 I would love to visit a museum filled with only motorsports photography someday, if something like that even exists. Near the front of the hall, you can see some of the newer style F1 McLarens. Rod was telling me, he thinks they are going to have to add a Lewis Hamilton car to this collection pretty soon! I thought the painted backdrop with all the photographers was pretty cool! People should show more respect to motorsports photographers! 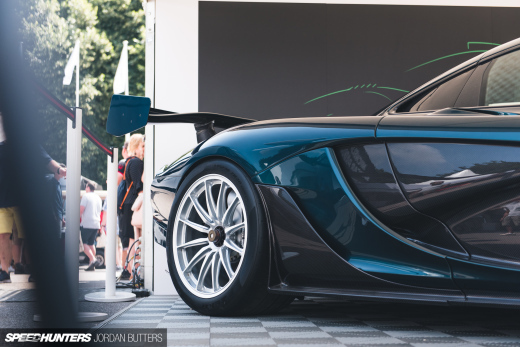 This particular car stands out from the rest, because it is quite special. 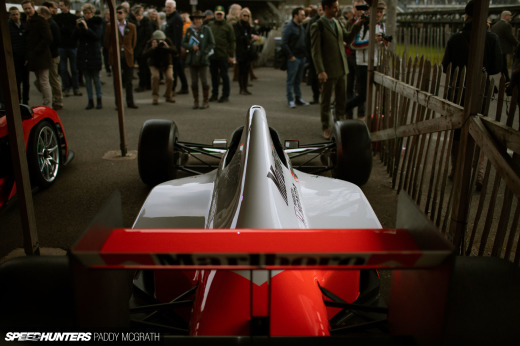 This McLaren Ford MP4/8A is the car that Ayrton Senna drove when he won his final victory for McLaren – the Australian Grand Prix, which was the final event of the 1993 World Championship season. This car is also special to Donington Park, because it is the same car he drove in the European Grand Prix at Donington in April of 1993, which was the first Grand Prix held at Donington Park in 55 years. At this event, many say that Senna drove the most famous opening lap in Grand Prix history. Check the YouTube video links below – Senna passed five cars on the opening lap of the race, and was leading the race by the end of his first lap! Senna was such an incredible driver; you really need to check out the videos! Also, a funny note – Senna had the fastest lap of the race, even while he passed through pit lane! He entered the pit, but the pit crew wasn't ready for him, so he sped through put lane to rejoin the circuit without stopping! Haha! They must not have had pit lane top speeds back then! 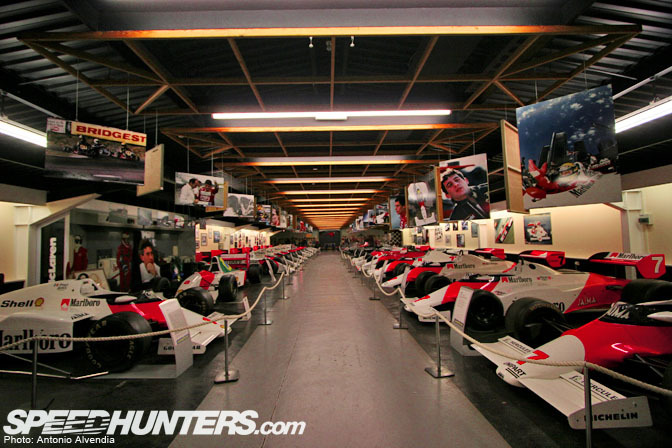 This hall is truly amazing, and the Senna Memorial exhibition truly moved me. You need to go to Donington Park and experience this for yourself. Here's another shot of Ayrton Senna's famous McLaren Ford, the last car he ever won a race with. 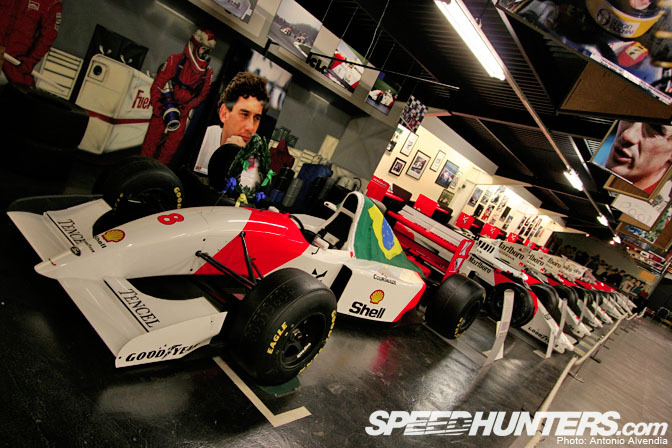 I have nothing but the utmost respect for Ayrton Senna – his passion, his motivation, his achievements, and his legend. 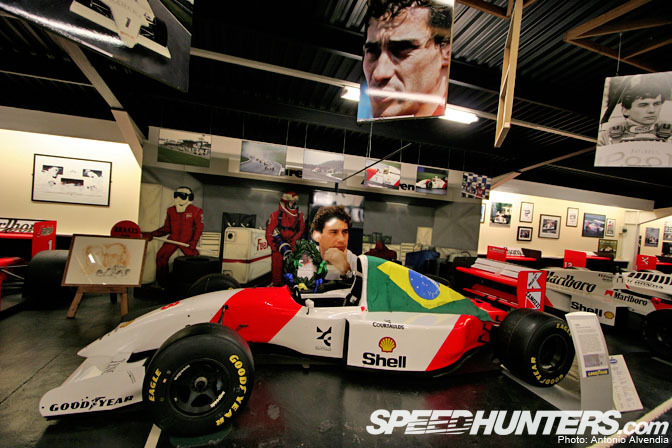 Ayrton Senna da Silva, rest in peace. You will not be forgotten. re pit lane and fastest lap - the pit lane cuts out a corner, so that helps. I've heard of people naming their kids "Silvia" and my friend Ben Schwartz named his daughter "Sky Lynn" (not after Skyline though, or after the Sears Autocenter Saturn Sky that he put into the wall at FD West Virginia...) which sounds close to a "car name"
Antonio just name your child eight six alvendia. That way it doesn't matter if it is a girl or boy. And they would be "living the 86 life" from the get go. Years ago on Speedtv's f1 decade, they showed that amazing race. Fantastic drive on his part. I hope someone shows a vid of the Adelaide race, i have never seen it.